MILES CITY, Mont. 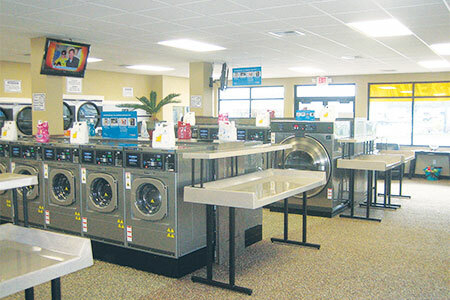 — Craving personal service and a 60-minute wash and dry, families, singles, professionals and pets frequent the Express Laundry Center – a high-speed, 2,400-square-foot coin laundry in Miles City, Mont. Complete with Sage’s Dog Wash, the one-stop laundry not only delivers a quick wash and Fido-cleaning, it offers an array of amenities and time-saving drop-off services, including wash/dry/fold, load and leave, and dry cleaning. Laundry clients are privy to comfy leather recliners, soap and snack vending machines, video games, free Wi-Fi, flat-screen televisions, high-speed laundry equipment, and the adjoining Sage’s Dog Wash. Open from 6 a.m. to 11 p.m. daily, the Express Laundry Center is attended 8 a.m. to 5 p.m. weekdays, 8 a.m. to 4 p.m. Saturdays and 10 a.m. to 4 p.m. Sundays. The Express Laundry Center delivers timesaving convenience, which extends to the drop-off services customers crave. “Our drop-off service is really big. We market to everyone, from homeowners and professionals, to people who rent and don’t have washers at home. People are busy and want to save time,” says Shane. The laundry caters to truck drivers, business owners, families, motels, restaurants and care homes – anyone needing a hand with laundry. “We keep one of the 20-pound-capacity washers and one of the 30-pound stack dryers in the back reserved for heavily soiled wash/dry/fold,” Shane adds. The Express Laundry Center generates 40% of its revenue through drop-off services. In total, the laundry boasts 22 ExpressWash™ Washers, including 16 20-pounders, three 30-pounders, and three 40-pounders; two Continental 75-pound-capacity PowerLoad Washer-Extractors; two 75-pound-capacity, single-pocket dryers; and two 45- and eight 30-pound-capacity dual-pocket stack dryers. How does she do it? 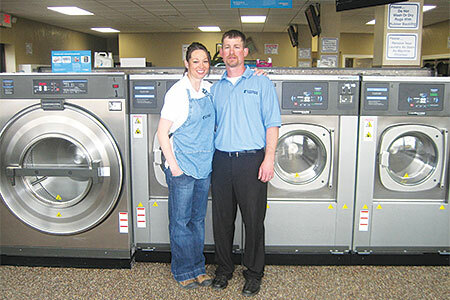 “She uses the big washers, which cost less per pound and saves money on the dryers,” says Shane. Simplifying life further for customers, the McKinneys placed dual-coin acceptors on the laundry’s bigger machines. Thus, the change machine is a double-service coin changer that dispenses dollar coins or quarters. “This saves customers time, and they don’t have to lug tons of quarters around. Instead, they can use a few dollar coins,” says Shane. Complementing the Express Laundry Center is Sage’s Dog Wash – the first and only coin-operated self-service dog wash in Miles City. In its own corner of the laundry, separated by a glass partition, pets undergo the ultimate washing experience as laundry customers look on. Sage’s Dog Wash features a separate entrance for simple access. Pets are dried using the built-in blow dryer, or by hand with towels, which are provided. 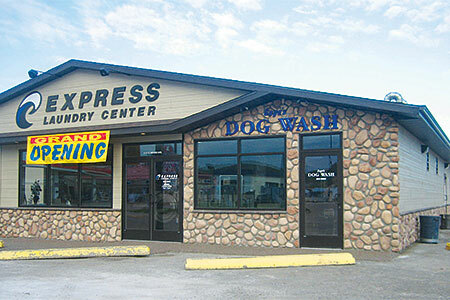 A one-stop solution, the Express Laundry Center provides customers a 60-minute wash/dry; a place to wash pets without the mess; and convenient drop-off services that save time.